Juan Fernandez Archipelago is a group of Chilean islands of volcanic origin located 670 km. off the coast of South America. It comprises the islands of Robinson Crusoe, Alexander Selkirk, Santa Clara and other smaller islets. Its population lives mainly on fishing, especially the extraction of spiny lobster, which has become its most characteristic product. 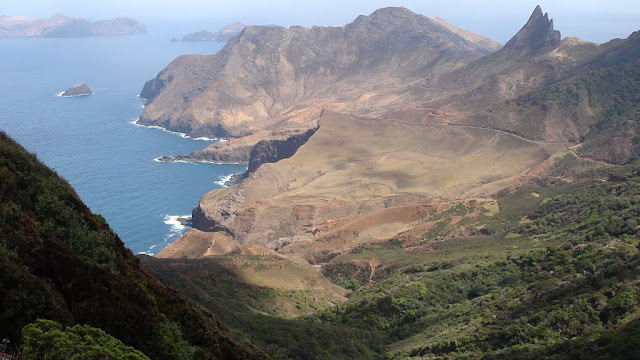 Juan Fernandez archipelago, with its island Robinson Crusoe, whose original name was Mas a Tierra, opened to the world through the novel "Life and Adventures of Alexander Selkirk, the real Robinson Crusoe", by Daniel Defoe, masterpiece of the literature, published in 1719. Alexander Selkirk was a Scottish sailor who spent four years and four months as a castaway in the most easterly of the Juan Fernandez Islands and whose stories inspired Defoe. of great hidden treasures, one of them might have been buried in 1714 by the Spanish Juan Esteban Ubilla y Echeverria which would consist of 800 barrels of gold valued at US$ 10,000 million, a hundred chests of silver, a golden rose with emeralds and gemstones, treasure that is still being sought today. There are also stories of past wars. In 1915, during the World War I, the German cruiser SMS Dresden was dynamited by its own crew in Cumberland Bay, after being hidden for months in the Quintupeu fjord, Chilean Patagonia, and being chased and attacked by the British vessels HMS Kent, HMS Glasgow and HMS Orama. Today, more than one hundred years after the events, the Dresden is at a depth of 78 meters and 500 meters from the beach of Cumberland Bay and of the nine German sailors killed in combat seven rest in the cemetery of the island in a tomb in charge of the Chilean Navy, very visited by tourists. In 2006, 91 years after the sinking, the bell of the Dresden could be rescued and sent on loan to Germany, where it was displayed at the Military Historical Museum of the city of Dresden. In February 2010, an 8.8 magnitude earthquake shook Central and Southern Continental Chile, the earthquake itself was not felt in the islands but triggered a tsunami with waves up to 15 meters height which caused severe material damage and death. After the disaster, Robinson Crusoe has slowly been returning to normal in all areas, one of them tourism because apart from its natural surroundings, it offers a unique setting for snorkeling, taste traditional spiny lobster or enjoy the sunsets. Despite having great attractions, the tourist traffic in Robinson Crusoe and adjacent islands is still modest. Few Chileans dare to reach this so remote, unknown but wonderful place on Earth. For the remoteness of its location and many other reasons (no magazines or local newspapers, common mobile phones do not work either), the English newspaper The Independent chose the Archipelago as one of the top six islands of South America to disconnect from the World. 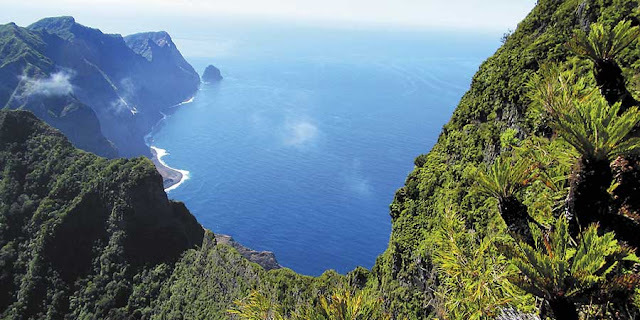 Here is a list of places to visit and activities in Robinson Crusoe Island. A tour through the main attractions of the island, must undoubtedly include a visit to the "Mirador de Selkirk" (Selkirk's Lookout). This is located at Cerro Portezuelo, 565 mts. above sea level, a point that dominates much of the geography of Robinson Crusoe. This was the place which the marooned sailor often climbed to scan the horizon if a ship that might rescue him was approaching. Fate and his eagerness to survive allowed him to endure this condition of almost four and a half years of isolation. Selkirk was close to a state of barbarism when on January 31, 1709 arrived on the island another English expedition, commanded by Captain Woodes Rogers, who finally took him back to London. There, Selkirk's story began spreading everywhere reaching the ears of Daniel Defoe, who immortalized the experience of the Scottish sailor through his work published in 1719, the novel also captures the adventures lived by the Spanish Pedro Serrano, who in turn suffered a similar experience in a Caribbean island. Robinson Crusoe is considered the first English novel. At the site there are two commemorative plaques of the adventure of Selkirk, one left by the officials of the British vessel Topaze and other left by a direct descendant of the Scottish pirate. On March 14, 1915 During the World War I, the German cruiser Dresden was chased, attacked and sunk by a fleet of the Royal Navy in Bahia Cumberland, Robinson Crusoe Island. Some of the artillery shells missed their target and remained embedded in the slopes of the surrounding cliffs of Cumberland bay. These shots came from the HMS Kent and HMS Glasgow. Also there was damage to the village of San Juan Bautista, so once completed the brief battle, the Commander of the Glasgow compensated the affected civilians. Until today, the impacts remain intact in the vicinity of San Juan Bautista and you can see and touch the shells that 100 years ago sank the Dresden. In this small graveyard located at the northern end of the town you can also visit the tombs of some sailors of the SMS Dresden, German warship of the First World War and of Baron Alfred von Rodt. The Swiss settler Alfred von Rodt, known as Baron Rodt, was a visionary pioneer, shipping entrepreneur and businessman who died in 1905 and could not see all his projects completed but had the merit of having started a work of extraordinary importance for the archipelago, trying to promote the colonization and economic development of Juan Fernandez Islands. Located in Bahia Cumberland, in the proximity of Fuerte Santa Barbara, "La Cueva de Los Patriotas" are some caves made in the rocks surrounding Cumberland Bay, set of excavations dating from the eighteenth century during the colonial period, reign of Viceroy Jose Antonio Manso de Velasco. At the beginning, the caves were used to house prisoners convicted by the Audiencia of Santiago and Quito. After the defeat experienced by the patriot forces in the Battle of Rancagua in 1814, different authorities were banished to the island, who made use of the excavations for shelter from inclement weather. Many of the deportees were voluntarily followed by sons and daughters, besides some of their servants. During the twentieth century it was also used to exile political prisoners. Because of the clarity of the waters, remains of ancient shipwrecks and the rich marine life, it can be said, -without exaggeration-, that this part of the South Pacific around Robinson Crusoe and Juan Fernandez Archipelago is a true paradise for diving and snorkeling, this activity being by far one of the most requested on the islands. Besides its underwater life, also abound caves and crevices where many small fish hide from predators and what makes the undersea tours much more interesting. The most suitable season is from October to March, the temperature of the water is lukewarm as the area is beyond the influence of the Humboldt Cold Current. Some of the most interesting places include: Punta Loberia, an ideal place for snorkeling and diving at Bahia Cumberland, five minute crossing from the village of San Juan Bautista, so called because of the friendly Sea Lions, characteristic of the place. At just a few meters depth, there is a variety of fish, molluscs and crustaceans and over 20 meters you can find two enormous anchors that belonged to the British ship Speedwell, which sank in these waters in 1720 when it was commanded by Captain George Shelvocke who had been sent as a privateer to the Chilean Sea by the commercial company London Adventurer Knights, Punta San Carlos, on the opposite end of Punta Loberia, near the pier of Bahia Cumberland, where the German cruiser Dresden was shelled and sunk by three British ships in March 1915, during the First World War. Punta San Carlos is an underwater volcanic tongue with an incredible abundance of marine species. 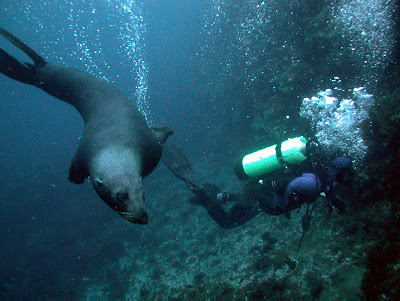 Another place that offers optimal conditions for diving is Loberia Tres Puntas, East of Robinson Crusoe, without a doubt, one the top diving spots where hundreds of Sea Lions approach the explorers, some of them just a few centimeters from them, so in the beginning, the adventure is a bit intimidating. Approximately an hour by boat from Bahia Cumberland is located another of the "musts" for divers of Juan Fernandez, El Cernicalo, underwater seascape of large rock formations, with average depths of 25-45 meters, visited by large schools of vidriolas, pompanos, horse mackerels and beautiful gardens of anemones. Another great place for diving is Salsipuedes where there is a volcanic formation full of anemones, the place name Salsipuedes (Get-out-if-you-can) does not specifically refers to these marine depths but to the coastal part of very thick vegetation where there is a zigzag-shaped path and steep slopes. South of the town of San Juan Bautista, from the area of "El Palillo" to "El Adriatico" is located the only underwater section of "El Sendero de Chile", a 500 meters stretch in which you can see the beauty and great wealth of this part of the seabed, of high visibility and approximate depth of 20 meters, with temperatures ranging between 14°C in winter and 21°C in summer. "El Sendero de Chile" (Chilean National Trail) is a set of trails and routes along the territory from North to South that are enabled for the practice of hiking. There are several Tour Operators, Diving Centers and Eco Lodges at Robinson Crusoe you can contact offering tours and services to these and many other points of interest on the islands. 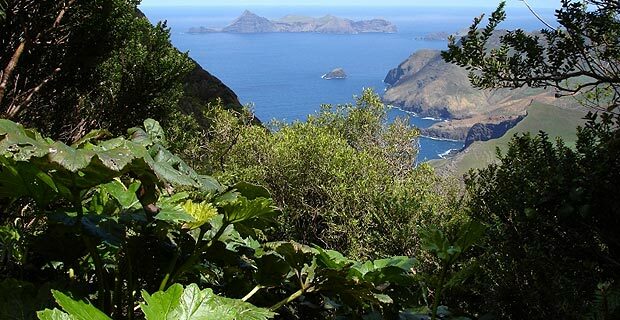 Created on January 16, 1935, Parque Nacional Archipielago Juan Fernandez is a protected natural area of 9571 hectares corresponding to Alejandro Selkirk Island, Santa Clara and much of Robinson Crusoe. In 1977 the Park was declared a World Biosphere Reserve by UNESCO, due to the approximately 130 native species, although currently many of them are endangered because of the introduction of new species. The administration of Juan Fernandez National Park is located at 130, Vicente Gonzalez Street, San Juan Bautista, Robinson Crusoe Island. The Park itself has shelters, picnic areas and lookouts, also with tourist routes and signage that allow the displacement of visitors in guided or self-guided tours, visiting the most beautiful places on the island and the various panoramic it has to offer. 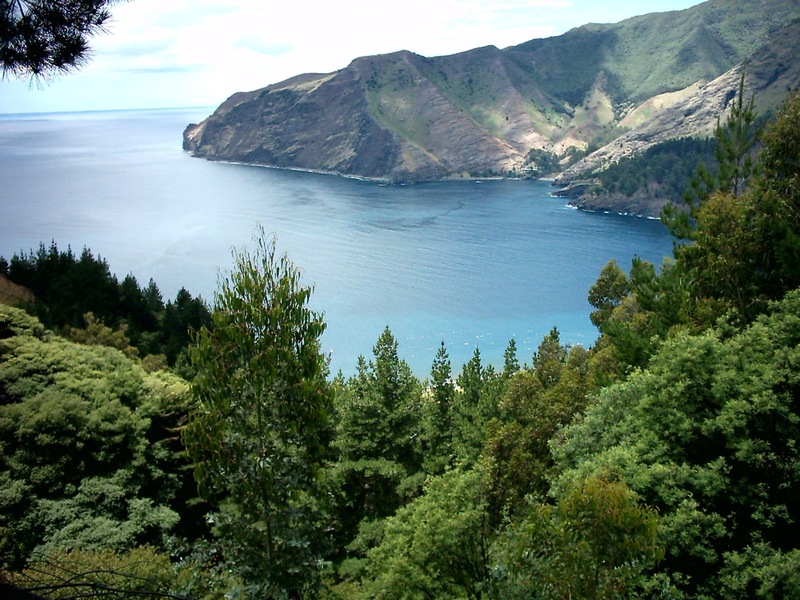 The views of Juan Fernandez Islands are diverse, since they range from landscapes with dense vegetation or as sublime as Bahia Cumberland to the wild geography of its cliffs or very arid, almost desert corners. Currently, this World Biosphere Reserve has species considered endangered so it has been launched a joint campaign between the Government of Valparaiso, the Ministry of Agriculture and local Authorities, which aims to generate greater awareness among visitors to not import species or products, either by air or sea, which could jeopardize the unique ecosystem of the territory. With regard to fauna, there are unique species such as the Colibri de Juan Fernandez (Juan Fernandez Hummingbird), which originated and evolved on the islands, a small bird but with the remarkable ability to fly in all directions, even backwards. Today, the Juan Fernandez Hummingbird is considered in a state of extinction because their number is estimated at just over 1,000 specimens so their capture, hunting or transportation are prohibited. Typical of the archipelago is also the Lobo Fino de Juan Fernandez (Juan Fernandez Fur Seal), whose population is estimated at about 5,000 specimens after having been considered extinct in the mid-twentieth century. Another typical animal is the Cabra de Juan Fernandez (Juan Fernandez Islands' Goat), introduced by the Spanish Captain shortly after discovering the island. In those days it was customary to release some of these animals in remote places to ensure the survival of explorers who would arrive later. These Goats would descend from a pair of these animals brought from the Pyrenees to the islands, but after centuries of living in the wild, their appearance has changed to make them animals with their own characteristics. A must which will also be rewarded with an excellent view of Cumberland Bay and the coastal area of the town of San Juan Bautista. It is a partial reconstruction of an ancient stronghold with its original cannons which in the past constituted the main defense of the island of Mas a Tierra (today Robinson Crusoe). It was built by the Spanish Crown in 1749 as a protection against pirates and privateers, its walls were made of stone, complemented with 16 cannons belonging to 6 batteries of heavy artillery of the time. The reconstruction dates back to 1974, conducted by a multidisciplinary team from the University of Chile and declared a Historical Monument in 1979. Plazoleta El Yunque is a quiet forest clearing, with picnic area, water and bathrooms, located at the foot of Mount El Yunque, the island's highest peak, where you can find ruins of the house of Hugo Weber, a crew member of the German battleship "Dresden", sunk here during the First World War. Weber asked for the concession of this place and lived here for more than twelve years, being later known as "The German Robinson". El Yunque (The Anvil) is one of the places of greatest endemic (native) vegetation near the town, accessible through a trekking path, marked and self-guided, which introduces visitors to the endemic forest, where a great diversity of flora can be seen. This place has a special feature, its exclusive relationship with the Picaflor Rojo de Juan Fernandez (Juan Fernandez Red Hummingbird). This is the most characteristic species of the archipelago, it is a native Hummingbird so called due to red plumage of the male, while the female is green. Its current population is estimated at no more than 400 birds, which is considered endangered. The place has a trekking trail, full of surprises and beautiful views. This trail leads to the foot of the highest peak of the island, Cerro El Yunque with a height of 915 m. This is the most wooded area of the island since here there is a native forest of Pangue, Canelos and Naranjillos. Few people have had the opportunity to climb to the summit of Cerro El Yunque and this is because this hill, World Biosphere Reserve, has a unique ecosystem in the World and requires maximum protection, therefore only authorized by the National Forestry Corporation (CONAF) activities are allowed. The longest trek that can be performed throughout the island is to Punta de Isla, on the West end of Robinson Crusoe, a total of 15 km. starting from the town of San Juan Bautista, another way to make the journey is to embark on to Bahia El Padre and then start the trek back to the village. This route is one of the stretches of "El Sendero de Chile" (Chile's National Trail) in Juan Fernandez Islands. The trek normally starts from the village to "El Mirador de Selkirk" (Selkirk's Lookout), then go down to the area of Villagra where there is a refuge of CONAF (National Forest Corporation), fitted out for camping. Here you can make a stop on the route and go down to Ramplones, an ideal place to enjoy the sea from a lesser-known side of the island, fishing or taking a sea bath in natural rock pools, there is a colony of Sea Lions and a variety of fish, this section must be done with certified guides. The trek continues along a path in good condition that runs along much of the NW slope of the Isla Robinson Crusoe to the area of Punta de Isla, on the way you will see a gradual change in the landscape, with various changes in the hues of the land, species flora and fauna and islets in the sea. Before arriving in Punta de Isla, in the field of Tierras Blancas, there is a large colony of Fur Seals. Once in the area of Punta de Isla, you can appreciate a diversity of elements that make it very attractive for visitors such as Playa El Arenal, created at the mercy of the prevailing winds and surrounded by cliffs and Sea Lions, also El Puente, Las Cuatrocientas, Bahia del Padre, the Aerodrome, and Santa Clara Island, uninhabited, the smallest of the archipelago of Juan Fernandez, here CONAF Protected Reserve can be visited only with prior authorization. If you choose to travel by sea, Bahia del Padre will be your arrival point to the island as this is the place where the local pier is located. It is a very closed bay, formed by an underwater crater surrounded by cliffs, yellowish ground with little or no vegetation. The view from above of its semicircular shape is spectacular. When the visitors arrive airway to the local airfield, very near, and once the plane has landed, they must also go to this bay to board the barge that will take them to the town of Juan Bautista, the navigation takes about an hour and a half. Puerto Ingles is an area close to San Juan Bautista, about fifteen minutes by boat from Cumberland Bay, made up of a plain at the bottom of a ravine surrounded by hills, with the Cerro Alto, of 600 mts. to the left. In this place which is accessible by sea, there is a series of features that make it a tourist attraction. In Puerto Ingles have been excavations in search of the great treasure of Robinson Crusoe, supposedly buried here. One of the projects is conducted by the American historian and entrepreneur Bernard Kaiser, which since 1999 has unsuccesfully tried to find the treasure, of which it is said to be composed of 846 barrels of ingots and pieces of Inca gold, worth around 10,000 millions of dollars. Also in this place it is located the so-called Cave of Robinson Crusoe, which corresponds to a rock grotto, where is supposed the sailor Alexander Selkirk established his place of operations during his stay on the island. From Bahia Cumberland and to the opposite side of Puerto Ingles, is situated Puerto Frances, where once French pirates landed on the island. There are two ways to make this tour, the first one is by boat, a 20 minutes voyage sailing from the village to Puerto Frances, from there you have to climb on foot or horseback to the base of Cerro La Piña (La Piña Mount) to fully appreciate the stunning views. The alternative is to make the entire trek on foot or horseback from San Juan Bautista. This land route runs along the coast, over mountains with steep falls to the sea, crossing Cerro Centinela (Centinela Mount) and passing through red and orange color lands. After four hours you reach Puerto Frances. From there you visit "El Rebaje de la Piña", lookout with a spectacular view of the highest cliffs of Robinson Crusoe, overlooking in the distance the island of Santa Clara and the South coast of Robinson Crusoe. By sea, from the port of Valparaiso the voyage takes about 40 hours, usually performed in the last week of each month with M/V Antonio belonging to Transmarko Co.